The POST OFFICE is holding its Stamp Out Hunger Food Drive on Saturday, May 11. Please consider donating food for this nationwide event. We also need a lot of help at the Pantry from noon to 5 p.m. If you can work any portion of that time, just show up and we will give you a job. We need workers to sort, date check, and store all the items that are collected by the postal workers and brought to the pantry. We will need some folks outside unloading and doing the initial rough sorting. We are renting a tent to keep outside workers more protected, so dress in layers for either inside or outside work. If you need glasses to read dates on cans, don’t forget them. Children are welcomed. Children under age 13 must stay with an adult relative and be old enough to do the required work. You do not need to sign up in advance to work. Want to hold a Food Drive for the Pantry? If you do, please let us know by stopping by the Pantry during open hours, calling us at 414-251-6848, or e-mailing us at info@fallsfoodpantry.org. You can pick up food donation boxes, signs, and other materials at the Pantry during open hours on Tuesdays or Thursdays. You can also download and print many materials on the right side of this page under "PLAN AN EVENT." Once you have collected the food, you can drop off non-perishable food on the carts in our unlocked foyer 24/7. 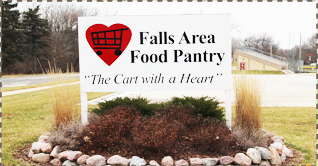 Please be sure to drop off perishable food when the Pantry is open on Tuesdays and Thursdays from 12 - 2 p.m. and from 5 - 7 p.m. Tell us if you would like us promote your event on our website and Facebook page. Please send us information and photos for your events so we can promote them on our website and Facebook page. We thank the many, many individuals, businesses, churches, and organizations who have held events for our pantry. We need all of your help to distribute food to those in need, pay utilities, and buy meat and fresh food. Thank you to everyone for helping to keep the Pantry going. Get together with your family, friends, school, or co-workers to plan an event to benefit the Pantry. Your efforts can make a difference! Plan an event around a theme or holiday. Make a competition by challenging another group. Ask for canned goods in conjunction with an event at your school or office. Use social media to promote your event and share pictures on Facebook. Contact us to register your event or to get more information about planning an event.